For the first time in the history of the Balkan League there will be an Albanian team in the Final. 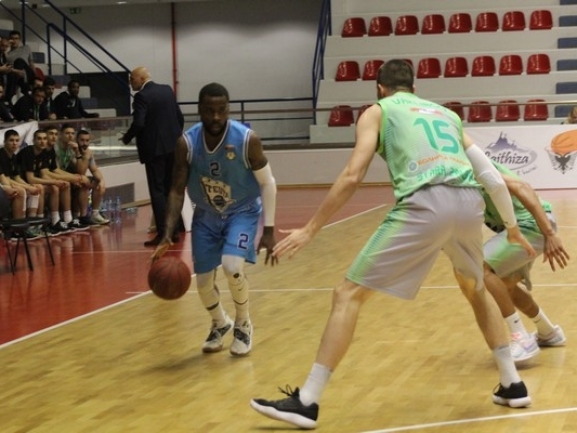 That became a fact after KS Teuta defeated BC Beroe 80-68 in the second semifinal. The Durres side overcame a bad start to the second half and finished the game really strong to achieve this historic result. In the big final on Sunday the team will meet KK Blokotehna while Beroe will play Academic Bultex 99 in the game for 3rd place. In an even first quarter no team could take any lead and it finished with the score tied at 20. The first five points in the second were for Teuta and while Beroe answered, the Durres team was on fire and managed to pull away. The took a 6-point lead and managed to keep it until the break. Beroe came out on fire in the second half and started it with a great 15-0 run to take the lead. Then The Greens kept it but didn′t manage to build a big lead and the third quarter finished with just 3 difference between the teams. Teuta though came out strong in the fourth and thanks to a 13-3 in the first few minutes and pulled away. That was the turning point in the contest as Beroe didn′t recover after and Teuta cruised on to take the victory. CJ Wilson was the top performer for the winners with 20 points and 9 assists. Endrit Hysenagolli had a double-double with 15 points and 10 rebounds as Robert Shestani scored 11 points. Beroe was led by Conner Frankamp who finished with 26 points and 5 assists. Tre Coggins added 15 point while Aleksandar Yanev had 14 and 8 rebounds.